True soccer fans want to have the most current scores and scheduling information available about the game and the teams they love. With Livescore Today these ardent fans have access to accurate soccer scores from all over the world, updated in real time. There is no more need to go to a general sports news site and wade through dozens of different sports pages. Get soccer, more soccer and only soccer! Livescore Today is organized by country, making it simple to scroll to any country of interest and check the scores for the various leagues in that nation. Within each country’s entry the teams are organized by league and division as needed. There are even miniature flags next to the names of countries to enable faster browsing. There is no need to go to multiple sites to check scores from different countries and leagues – you can find them all at Livescore Today. Go to the “live” tab and click for games in progress or “today” for all games of the day. Check scores from the previous day’s games as well. 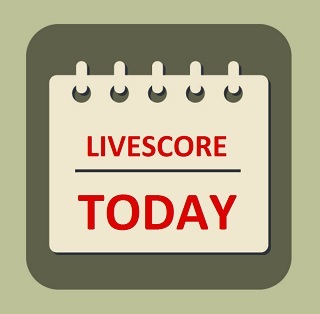 Livescore Today will tell you which games are completed and which are still in progress. Those games in progress are indicated by a green dot for your convenience as you browse the lists. Use Livescore Today to keep up with game schedules as well as scores. You can click on a date or on a country for easy browsing of sports information. It can be disappointing to miss a big match, but Livescore Today means you can still know the score at home, at work or while traveling. All you need is internet access. Many other sports websites try to be all things to all sports fans by covering a multitude of sports. Do you really want to search through dozens of stories about college gymnastics, professional baseball, Grand Prix racing and more in your quest to find and click the “soccer” button? Would you rather skip the celebrity stories about sports drama and romance so you can get straight to the bottom line? Are you more interested in scores than in the business dealings of owners and managers? If so, Livescore Today is the site for you! Livescore Today is a neat, clean website, easy to read without annoying pop-up advertising or other distractions. When you want just the scores and schedules for soccer leagues anywhere around the world. Soccer information is organized simply for the convenience of you, the soccer fan.